May 18, 2017, SOLD OUT! Bold Bay's Ellie, a.k.a. "LB", is a 50lb speed queen from Maryland's Eastern Shore. Excellent drive and energy that translates well, especially hunting over water. She completed 4 junior and 2 senior tests in her first summer of training and she'll continue great things. 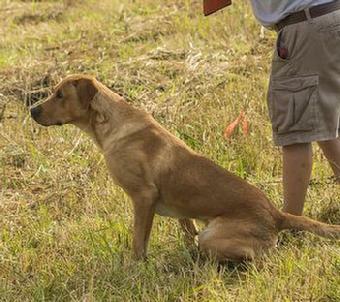 A perfect D&S combination of hunting skill and family companionship, she is a sweetheart. LB is owned by Chris & Tracy Heckman, Kutztown, PA.
Reggie is a well structured, handsome, dark yellow (fox red) male. He is very birdy and loves to work in the field, but can turn it off and be a wonderful family member. Reggie is an excellent marker and runs blinds flawlessly. 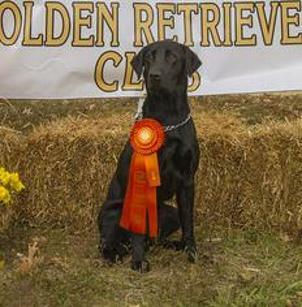 D & S Retrievers was fortunate to have Reggie since he was 6 months old for a serious training program. Reggie needs 1 more pass for his senior title and then he will continue his training for Master tests. Reggie is owned by Joe & Donna Schneider in Mt. Bethel, PA.
Dew Claws were removed on May 22. Pups will be wormed at 3, 5, & 7 weeks of age, and pups will receive their 6 week vaccines and be vet checked and certified healthy by Silver Maple Veterinary Clinic. Born and raised in our home....well socialized. Ready for new homes July 7, 2017.